It’s time to dust off your basket, bust out the sandals, and head outside to relish the seasonal bounty of Ontario. Tuesday marks the unofficial start of open-air Farmer’s Market season, with the opening of Friends of Riverdale Farm Farmers’ Market. Now in its 7th year, it runs every Tuesday from 3-7 p.m. The timing is perfect; how good is it going to feel basking in the sun, the suddenly-warm air rejuvenating your pale winter skin, with playful animals scurrying around while you pick up some of the freshest food available in the city? This is the wondrous time of year when you can have the best of all worlds. Though the debate about organic being nutritionally better or environmentally better continues, many people feel that when they are able, organic is the right choice for them. But of course, local is the new organic, and let’s not forget eating according to the season. Whatever your inclination, fresh produce and lovingly-made market goods, free of additives and preservatives, are undeniably good for you (of course moderation is still the key when it comes to things like irresistibly fresh, local ice cream). Between May and October in Toronto, there is a vast array of choice, with outdoor farmers’ markets in virtually every corner of the GTA. For those focusing on organic, don’t forget to round out your week with Thursdays from 3-7 p.m. in Dufferin Grove Park (this runs year round, but will now be outside), Fridays starting June 8th from 2-7 p.m. at Birchcliff Farmers’ Market on Kingston Road in Scarborough, and Saturdays from 8:30 a.m.-1:30 p.m. at The Village Market in The Waldorf School (Bathurst north of Hwy. 7, also year round). You can expect to see even more markets cropping up, as FoodShare has received funding from Project for Public Spaces in the U.S. to increase access to healthy food and enhance public space in Toronto. The focus is on sustainability, farmers’ interests, and building a network of small neighborhood markets through the Good Food Market program. Fresh food and fun for all is attainable—visit your local market today to nourish yourself, and your community. 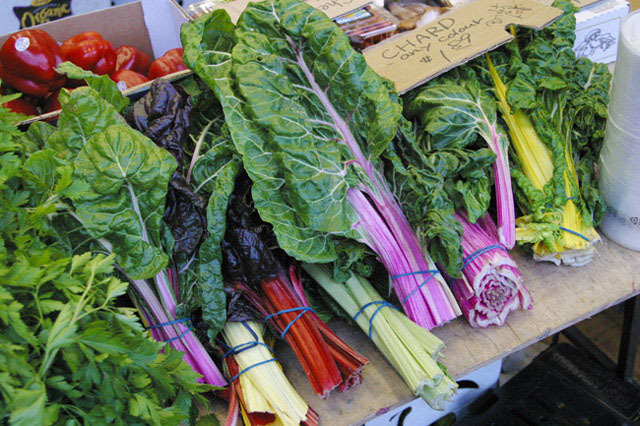 Photo of farmer Mike Lanigan’s swiss chard from The Village Market website.